And what’s so special, you might ask? Sasha is officially recognized by the American Kennel Club as Ozark Summer Highlands Sasha. We chose Ozark for our locale and Highlands for her heritage; we’re actually in the Ozark Highlands, so it’s a bit of a double play on that last word. We included Summer because we chose July 4th as her official birthday (independence, after all!) and because she has a warm sunny spirit. And I wanted her call name included because she came to us with that, so including Sasha gave us a bridge between her past and present. The organization sponsors many terrific programs all around the country, including many family-oriented competitive events. Two of these are Agility and Rally Obedience which both promote performance skills and opportunities for handlers and dogs to work as a team. Sasha got a taste of Rally Obedience as part of her “final exam” in the Intermediate Obedience class and she clearly enjoyed herself. 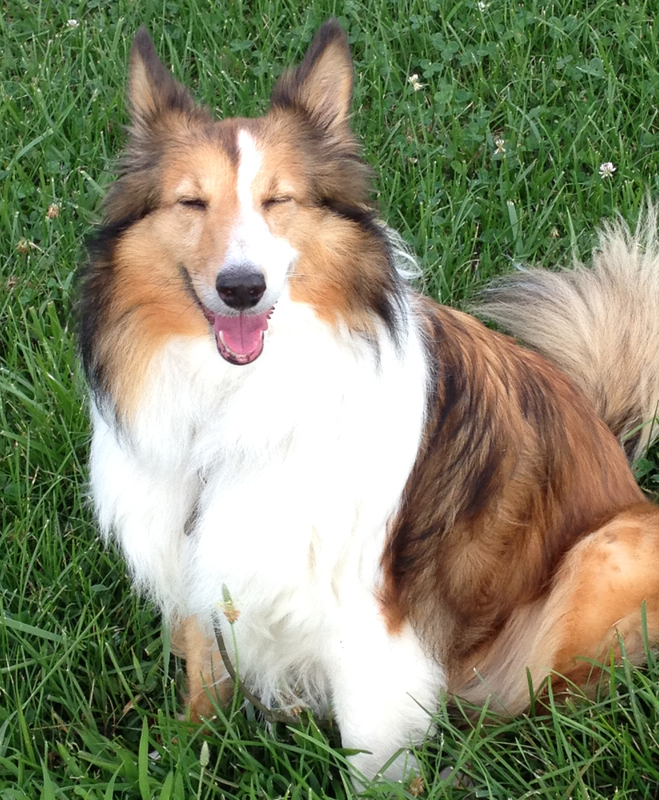 To participate in the AKC events, though, I needed to have Sasha recognized as a purebred Shetland Sheepdog–more commonly known as a Sheltie. And that’s where I ran into a glitch. If you’ve been following Sasha’s story, you may remember she came to us six months ago in poor condition after being surrendered to a rural county sheriff’s office with no documentation. Since then she’s been evaluated by breeders, groomers, an AKC judge (who breeds Shelties too), and other Sheltie owners. They all agree that she reflects the physical characteristics of the breed, and her temperament and habits are consistent with the breed as well, right down to “herding” anything that moves and that oh-so-distinctive piercing bark! I’ll close with this series of photos taken over the past six months as well as my sincere thanks to everyone who’s helped us along this journey! This entry was posted in American Kennel Club, Dogs!, Home page, Ozarks, Training and tagged AKC, Competition, Dogs, PAL program, Purebred Dogs. Bookmark the permalink. Congratulations on the success of getting Sasha registered. It has ben awhile since I have been to a dog show. I know how good AKC problems are. Our cat Kato is registered with their Home Again Program. She’s beautiful! I’m glad she rescued you. She’s having the time of her life now. Katie and I did obedience and she got the first title, and Rally, where she got novice and advanced. Now we’re retired and mostly spending our summers camping and going to her parks.